An SSL Certificate (Secure Sockets Layer) secures all information transmitted between your website and your customers. Providing the same methods of encryption that banks, governments and the military use. Each time information is transmitted it is encrypted with 256-bit encryption or higher, which would take millions of years to crack. Also know as TLS, it is the safest ways to ensure all data sent and received to your website visitors are safe with secure connections. Why do I need an SSL Certuficate? Haveing an SSL/TLS Certificate installed on your website is no longer an option in todays online world. It is a requirement. Not only do they ensure your customers information is safe, they also provide many benefits to your business online. 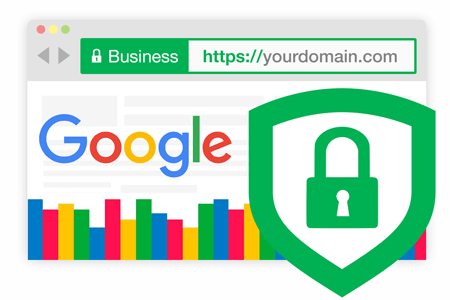 In 2014, Google announces that they will start to use secured websites ( https:// ) as a ranking factor in search engine results. You will also need to secure you website if you wish to accept Credit Card or peronsal information from customers. This is a requirment for any PCI compliance. No Payment Processor will accept your website without doing so. With it also proven to increase convertion rates from visitors to paying customers, with only a small investment cost, it can greatly increase your sales. They can also be a great benefit for a more professional email. A Domain Validated SSL Certificate is the most widely available and quickest to obtain. It is available for individuals, businesses, sole traders and private customers. With no paperwork involved, you can be up and running with a secure website within minutes. Business Validation, also named Organisation Validation (OV), gives your website and its visitors that complete level of trust you need, with a bit extra. Your business estabishment, address and phone will be validated by the Certificate Authority. Business Validation is recommended for registered businesses requiring complete trust from their customers for transactions and exchange of information. Customers will be able to see your business has been validated by a 3rd party through the included site seal. Extended Validation Certificates provide the highest Security and Increase Trust even more. They link your company information with your domain name while displaying it to the user within the green address bar. You will be able to protect your business from other websites impersonating your brand, products and company. Everyone visiting your website will instantly know who they are dealing with. Wildcard SSL/TLS Certs gets all your subdomains verified in just one go. Removing the need to make multiple purchases for securing all your sites and subdomains. It’s an inexpensive and effective option that ensures your entire site is adequately protected. In addition, you’ll be able to secure any subdomain, as your site becomes larger. Multi-Domain Certs also named Subject Alternative Name (SAN) SSL Certificates or Unified Communication Certificates (UCC) are available for securing up to 100 domains. SAN Certificates are often used to secure Microsoft Exchange Servers and Office Communications Servers. Although we try to make the configuration and installation process as simple as possible, you may run into something your not to sure about. Our team of experts are available via email, website live chat, or phone to assist with your new purchase. They will try to get you up and running as quicly as possible with the best security. 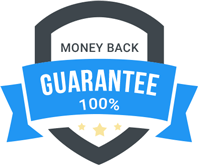 Get the Security you Need, or your Money Back! We have 1000's of happy customers, and this shows in their reviews and returned purchases. However, we understand you may change your mind. Or find out you purchased the wrong item. This is why we offer a money back guarantee if you want to cancel the purchase and get a refund.